The introduction of Common Core State Standards in 2010 had an obvious impact on the lives of teachers everywhere. Not only did they define what children in K-12 should be learning in school, they made it necessary for teachers to continually seek ways to implement them. Fortunately, teachers are able to use whatever tools they judge to be most helpful as adjuncts to meeting Common Core goals. But the challenge to identify ways to support what students need to achieve is a never-ending one. And it's no different if the class is English, math or agriculture. In Black River Falls, Wis., one of the common core standards agriculture instructor Brad Markhardt works hard to instill in his students is critical thinking. And the activity he created for that goal utilizes resources for students available on AgEdNet.com. An online subscription resource for agriculture curriculum since 1994, AgEdNet.com offers more than 1,300 online classroom-ready lessons, current agriculture news and more for the agriculture classroom. "Every semester, my kids must complete written reflections on four articles on AgEdNet.com," explains Markhardt. "They need to log in to the site, read an article and summarize the main ideas in their first paragraph. In the second paragraph, they need to explain their reaction to the topic, including whether or not they agreed with the author. And in the final paragraph, they describe the article's connection or relevance to them, their family or perhaps a topic we've covered in class, such as viral disease in pigs." AgEdNet.com has a wide range of news articles in the Timely Topics section of the site that work for many of Markhardt's lesson plans. 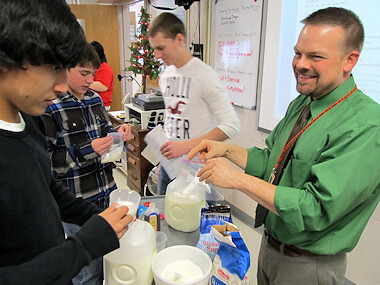 "Whether it's an actual agriculture topic like the export of Wisconsin's cranberry crop or somewhat eclectic ones like mulching trees or school lunches, there's a good variety that works for almost all of my lesson plans," explains Markhardt, who has taught agriculture for 22 years and was named 2012 Wisconsin Teacher of the Year. Black River Falls High School has subscribed to AgEdNet.com since 2011. "I want students to be able to recognize how current agriculture events relate to our classes and to their lives -- whether they eventually follow an agriculture career or not. AgEdNet.com does a good job with different types of articles, and they're not all difficult or long reads. Reading is not always a high priority for kids, so getting them to read more when it strikes the right chord can be very motivating," Markhardt says. Mike Griffith, agriculture instructor at Cumberland Regional High School in Cumberland, N.J., also finds that his subscription to AgEdNet.com helps him provide differentiated instruction for varying student needs. Griffith has been teaching 9-12th grade agriculture for 14 years. This past school year, his courses included production agriculture, agribusiness, and turf and nursery. In addition to the lessons available on the site for educators, there are news items, worksheets, quizzes and even puzzles his students can log in and access -- either in class or from home. "AgEdNet.com helps me meet individual student needs regardless of their academic capabilities," Griffith explains. "Students can read the material at their own pace. Some of the resources on the site focus on vocabulary, so students can check their word skills with fun tools such as the vocabulary puzzles. "As a teacher, the site also provides me with a heads-up on current news and events, as well as ideas for class content," he continues. "I can find basis or reference material, and lessons often have links to further resources that I can build upon." Griffith also points to the site's flexibility as another of its key benefits," "Students can log in to complete assignments or do research from home. Or, if they're going to be away for a few days, there's enough correlation to what I'm doing that they can keep up with classwork at their own pace." When he's not in class, Griffith has still been able to put AgEdNet.com to work. Even if the substitute teacher isn't knowledgeable about the lesson topic, students can log in, read the assigned lesson and do the worksheets. "The whole experience with AgEdNet.com has been very positive for us. And without a doubt, makes me a better teacher," Griffith says. Students in agriculture courses at Sarasota County Technical Institute in Florida -- which includes youth and adult learners -- are also benefiting from the variety of information on AgEdNet.com. "I have students that are reading at low (2nd grade) levels and others at college level, so there is enough variety of materials on AgEdNet.com that I can use to provide relevant lesson plans for all," says Randy Thies, who's in his 27th year as a teacher and an AgEdNet.com subscriber since 2007. He also sees evidence that those who have developed materials for the site are cognizant that lessons need to be provided in a very understandable way, including for those who don't read well. "I haven't found anything better than the variety of teaching tools available here." While lessons are arranged by curriculum areas, Thies often uses the AgEdNet.com search feature to find supporting materials for his current lesson plan. "I have taught large-animal and plant-related classes before, but I wanted to see just how much material AgEdNet.com had directly related to my current vet assistance curriculum. By searching on topics such as 'circulatory system,' I found lots of other helpful assets beyond what's listed just under vet assistance, including almost 10 PowerPoints for circulatory system lectures." Despite years of dealing with fluctuating school budgets, all three teachers find AgEdNet.com well worth the cost. "Speaking from 27 years of experience, it's a bargain for all the materials there," says Thies. "And I think that teachers just starting out would find it even more useful as they put lesson plans together." At Cumberland High School, which is one of the top users of AgEdNet.com, Griffith concurs. "For the price, it's a tremendous resource." Markhardt, too, gives AgEdNet.com high marks. "I definitely recommend it for any ag classroom. There are a lot of different periodicals in the ag industry that do a fine job, but what I like about AgEdNet.com is that it pulls all the best news and ideas together in one spot. It's a great clearinghouse of what's happening in the ag industry today." And when it's time to develop student learning objectives as part of educator effectiveness reporting, Markhardt points to AgEdNet.com "to show how we're promoting literacy in the classroom." Photo credit: Photo provided by Brad Markhardt.